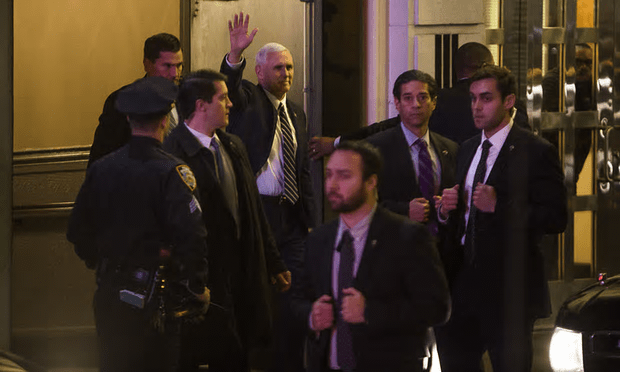 Mike Pence leaves the Richard Rodgers Theatre in New York after watching Hamilton [Image: Andres Kudacki/AP]. Donald Trump is getting exactly what he deserves after his outburst against actors who – let’s face it – only spoke to Vice President-elect Mike Pence. He’s being mocked as a “fragile little snowflake” after demanding that “the theatre must always be a safe and special place”. I daresay Abraham Lincoln would have preferred the theatre to be a “safe space” for politicians, but his example shows the scale of Trump’s miscalculation here. The American citizens on the stage only talked to the VP-elect – and in a respectful way. All the booing and abuse was coming from his fellow audience members – American citizens from whom he must earn any respect he, or his President, may try to demand. Neither Mr Pence nor Mr Trump are “fragile little snowflakes” – they are now prominent politicians who must step up to the role of statesmen. In a world where stage performers can act with more dignity, it seems they both have a long, long way to go. Brandon Dixon, who plays vice-president Aaron Burr, stepped forward and took out a piece of paper. He thanked the audience for seeing the show, then said: “Vice-president Mike Pence, I see you walking out, but I hope you will hear us, just a few moments. “There is nothing to boo here, ladies and gentlemen, we are sharing a story of love,” he said. “Mike Pence, we welcome you here. We are the diverse Americans who are alarmed and anxious that your new administration will not protect us, our planet, our children, our parents. “Or defend us and uphold our inalienable rights … we hope that this show has inspired you to uphold our American values and work on behalf of all of us,” he continued, to rising cheers. “We thank you for sharing this wonderful American story, told by a diverse group of men and women of different colors, creeds and orientations,” he concluded.